Bridgwater Town Team is flying the flag for local retailers in Bridgwater and celebrating the contribution independent businesses make to the UK economy. Across the country on 4 July 2014, the public will be encouraged to buy at least one item from their local independent shops to celebrate Independents’ Day 2014, and in Bridgwater we encourage shoppers to continue that support through the rest of the month and beyond! Organised nationally, by the National Skills Academy for Retail and People 1st and locally by Bridgwater Town Team, it is now in its fourth year. The campaign celebrates the contribution independent businesses make to the UK. It is also helping small businesses develop their skills, with a package of support available to destinations across the UK. Bridgwater Town Team are delighted to have been able to broker this support to help local independent traders. Avenue Blinds & Curtains, BB Gowns, Blackmore Farm, Earthstation, Fine Memorials, Ken Baker Hair Design, Inspirational Crafts, Jools Jewellery, SHHH!, Timeless Images, Treacle Well Tea Rooms, and Wilkins Jewellers, have all completed the WorldHost customer service training. Running in July, eighteen Independent Retailers are also signed up for a one to one Business Mentoring scheme. To raise awareness of this year’s campaign, there will be a range of “special offers” to shoppers in stores and on the FREE Bridgwater Town Guide app, along with a range of events and activities. For example, Christelo’s Art Boutique will be offering an “Independents” 10% discount to the first 10 customers every day, from the 4th to 31st July, and a free gift with every purchase for every customer on 4th July – Independence Day! Friday 4th July, Inspirational Crafts are running an Encaustic Workshop (Painting with an iron & beeswax) and a “Make & Take” card Making session. 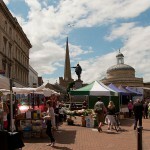 The Weekly Bridgwater Castle Market in Fore Street will be in full swing and is fully behind the campaign. 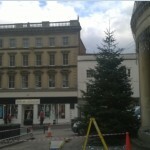 In partnership with TownGuideApps.com, the Town Team will be running an “Independents Trail” Competition. Shoppers can follow the trail map on the Bridgwater Town Guide mobile app, find the clues inside stores and enter some basic details to put yourself into a draw for your chance to win a fantastic prize package valued at over £600! An Apple iPad Mini, donated by Town Guide Apps, a Hamper from Cornhill Indoor Market and vouchers from participating retailers, AI Fosters, Armoury Gallery, BW News, Cornhill Grocers, Cornhill Indoor Market, Christelo’s Art Boutique, Flowers International, Hooks of Bridgwater, Inspirational Crafts, Jools (Jewellers), La Kage Restaurant, Lane-Hammett (Stationers), Richard’s Aquatics, SHHH! (Retro Fashion), Timeless Images (Photographers), Tim’s Cameras, Treacle Well Tea Rooms, and Wilkins Jewellers. Local Dignitaries will be out shopping on July 4th, and we have teamed up with the Bridgwater Mercury to run a fantastic window dressing competition. They are offering a great business package prize for the winner. £200 shop improvement grant, Commercial Photo-shoot by Timeless Images, Free ¼ page of advertising in Bridgwater Mercury, Free ½ day Business Mentoring Session (subject to eligibility), Display the “Bridgwater Town Team Cup” . The theme for this window dressing competition is “A beautiful Summer Day” Judging will take place on Friday 18th July 2014. Saturday 12th July there will be a “Food Market” in Fore Street between 9am – 3pm. Selling local produce, including cider, ice-cream, and Bath Bridge Bakery – who make the famous Bridgwater Manchips! There will be some familiar food traders from our Bridgwater Castle Market and new faces who will be bringing an international flavour to the occasion. There are a few stalls available. Contact Steve Griffiths on 07764 156 621 for further information. Saturday 19th July Steel Rose Tattoo Studio are running a Charity Tattoo Day, offering a wide range of Tattoos for £30 each. Andrew Bradbury from Lane Hammett Stationers said: “ Independents Day and Independent Retailer Month is a really important time for shops and business, and we’re calling on shoppers to come along and see what we have to offer”. 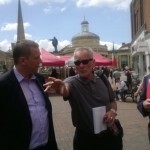 The Town Team takes a long hard look at what needs to be done with input from local councillors,traders and shoppers. A Town Centre Action plan has been submitted to the Town Council by Westover councillors and will be discussed by members along with a presentation by the Town Team at the Town council meeting of August 7th. Members of the public and especially traders are invited to come to the meeting. See what is happening locally on Bridgwater Town Team Facebook Page. You can also follow the campaign on Twitter @IndieDayUK, #IndieDay, Facebook www.facebook.com/IndependentsDay and visit www.indieday.co.uk. The Independents’ Day campaign is sponsored by Mondelez International. Bridgwater Town Team includes representatives from:Angel Place Shopping Centre; Boots; Bridgwater Chamber of Commerce; Bridgwater College; Bridgwater Industrialists; Bridgwater Mercury, Bridgwater Town Council; Federation of Small Businesses; GPR Traders; Hooks; Lyndon Brett Partnership; Magnox; McKinlays; Pardoes; Sedgemoor District Council; Small Industries Group; South West Businesses Against Crime; Tamlyn & Son, Timeless Images and Wilkinsons.